Recently, my Irishman came across a fascinating documentary called ‘Gut Reaction: What You Eat Could be Making You Ill‘. To cut a long story short, the program focused on the latest research on gut bacteria and health. Eating processed food = unhealthy gut bacteria = unhealthy person. Eating lots of fiber from fruit and vegetables = healthy gut bacteria = healthy person. I was surprised at the number of diseases linked to poor gut bacteria. They include emphysema, inflammatory bowel disease, MS, autism and asthma. The clear message was healthy gut bacteria calm the immune system and reduce inflammation. So even if you aren’t suffering from these diseases, your health will benefit from eating more veg and encouraging the growth of ‘good’ gut bacteria. How do you eat more veg? Here are my 2 favourite ways to include more vegetables (and fiber) in my diet. 1. Replace grain based foods with vegetables. For example, instead of serving a stir fry with steamed rice, I make cauliflower ‘rice’ by grating raw cauli in the food processor. Or instead of serving my bolognese sauce with spaghetti, I dump it on a big bed of baby spinach. Or for lunch, instead of sandwiches, I’m a fan of a big salad including legumes such as chickpeas, beans or lentils. Or in the cooler months I go for soups. 2. Eat veg for breakfast. Forget about toast and cereal. Most days I have poached eggs with some sort of veg or salad. My favourites are raw grated broccoli or cauliflower. Or I’ll have my eggs with lentils which are packed with fiber. Got any favourite tips for eating more veg? I’m always on the lookout for new ideas so I’d love to hear about them in the comments below! 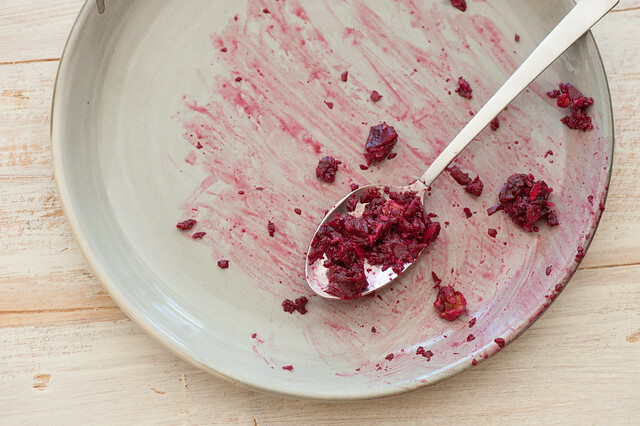 This lovely beet sauce was inspired by Heidi over at 101 Cookbooks. Being a big fan of beets I couldn’t resist such an exotic sounding dish. And I’m glad I didn’t. We had it with some pan fried salmon and a green salad. So good (and pretty too!). 1. Preheat your oven to 180C (350F). Trim beets and scrub and pop in the oven whole. Roast until tender, about an hour. 2. 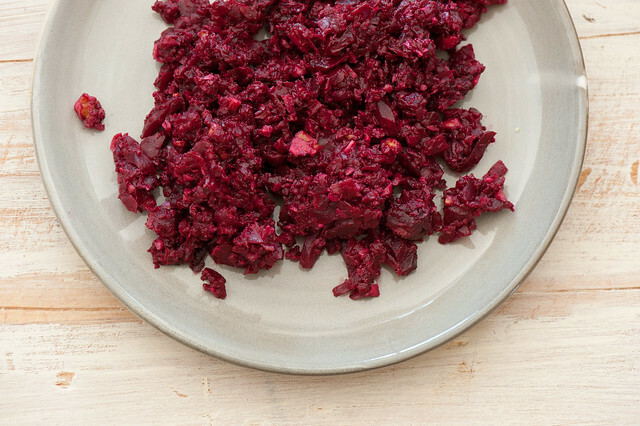 Let your beets cool then peel and pop the flesh in a food processor. Add walnuts, dates (if using) balsamic and garlic and whizz until you have a chunky paste. 3. Serve at room temperature or chill and serve cold. nut-free – replace walnuts with sourdough bread crumbs. more saucey – drizzle in some olive oil for a more saucey consistency. sugar-free – skip the dates and use sherry or red wine vinegar instead of the balsamic. different veg – I can imagine this working well with other root veg such as sweet potato or carrot. different accompaniments – as I mentioned it’s lovely with pan fried fish but also works well with chicken, a pork chop or even with lamb. Or serve with pita or Turkish bread as a dip or starter. Vegetarians will love it with pan fried halloumi or with grilled eggplant ‘steaks’. I had some leftovers with my poached eggs for breakfast. 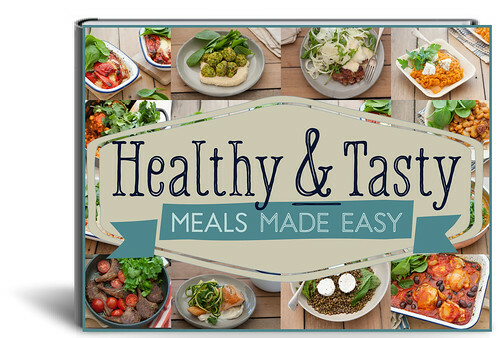 Have you seen my new eCookbook? I totally support the theory, but the weird thing is that I’ve eaten a zero-processed foods, high-vegetable diet for years and years, and still I developed ulcerative colitis, when really my gut flora should have been thriving! Elaine Gottschall’s Specific Carbohydrate Diet, which is essentially paleo, has helped a lot, so in my case it was likely too many grains that caused the imbalance. Thanks for sharing… interesting to hear that too many grains caused an imbalance for you. Hope your gut flora is thriving now! I’ve been studying a lot about gut flora lately, and have learned that it’s really a complex issue, although for people who have been eating a lot of processed foods, eating more veggies is definitely helpful. I’ve made a green smoothie a couple of times for breakfast, but didn’t enjoy it very much. I’ve also got a frittata recipe with spinach, and have plans to make an egg recipe that uses rutabaga “hash-browns”. Using my spiralizer to make squash noodles or making cauliflower rice are two additional ways I’ve been using to get more veggies/get away from too many grains. This beet sauce sounds like it’s to-die-for good! Love your ideas… especially the sound of the rutabaga ‘hash browns’ (we call them swedes here in Oz). They’re such an under appreciated vegetable! And I’ve heard a few people talking about spiralizers… think I need to investigate. With green smoothies, I’ve found it’s important to include some sort of fruit to balance out the ‘greenness’ and I like to include vanilla to make it more palatable as well. My Dad puts raw potatoes in his smoothies… definitely not recommending that! Personally I prefer smoothies to juice because I don’t think you can get too much insoluble fibre (unless you’re addicted to All Bran!). But that’s awesome if you’re loving your juicer go for it! This is my favourite recipe for coleslaw and everyone who tastes it agrees! Grate 1 whole raw beetroot, chop half a small purple cabbage, 1 red onion chopped and mix with your favourite yoghurt. Absolutely beautiful. Beetroot is my all time favourite. I juice every day with lemons and oranges and I even have a chocolate and beetroot cake that’s in my top 10 as well. Love the sound of your ‘slaw Toni… I bet it looks beautiful as well. hi Jules – i too always have vegies with my breakfast – in my case you may not approve of the fry up (I have bacon – locally raised ‘happy’ pigs and only one slice! – eggs and mushrooms, all fried in olive oil and butter – I have heard that a portion of butter as an animal fat is good for you). the vegies I have are a type of Shakshuka – i fry a largeish onion, add a punnet of baby plum tomatoes cut up, then a large tablespoon of cummin seeds (can be anything to spice it up), maybe some chopped up chilli and some thyme or basil or whatever. when that’s been going about 5-10 minutes i add a can of chick peas, cannellini beans, butter beans, or my favourite at the moment is black-eyed beans, they’re not so beanily intrusive. this amount lasts me 4-5 days on my own, so for two people a couple of days. i keep in the fridge and warm a portion up on my plate in the microwave while i’m frying the rest and making the coffee! beans, chickpeas, lentils etc, have replaced the ‘white goods’ (potatoes, which i used to love, bread, rice and pasta) in my diet, being slow and more satisfying carbs over a period of time. And I’m totally with you on the bacon… although I only have it once a week or so. Love my veg and so hope that’s keeping my gut healthy…. Yes I’m familiar with ‘resistant starch’ and if cooling and reheating your carbs works for you that’s great but I really prefer to replace the carbs with veg because there are so many other benefits of eating vegetables that don’t come from pasta. You’re definitely on the right trac. I was introduced to Metabolic Balance, what a Blessing. I wish I could tell the whole world. Not only do you eliminate medical bills, but you’re a healthier you. Please read up about it. Even diabetics are weaned from insulin. Drink lots of water, wait 5 hours between meals, and always start of your meal with protein. Wishing you a Joyful Christmas, and a New year filled with Peace, Love and happiness. That video called Gut Reaction was aired on Catalyst (SBS) in august in two parts, probably can still watch it. I’ve been a big fan of your website for years and more recently of your yellowbench site which offers fantastic advice and recipes. Your beetroot dish looks amazing and I’m keen to try it out this weekend. Just want to say that linking diet to things such as autism is incredibly inflammatory and though I see you are just quoting another source I think it would be prudent to be empathetic to your readers who may have family members who fall into the spectrum. There is so much written regarding autism that pointing out a link to diet (with no substantiating evidence) is just another knock for these people who are coping the best they can under an incredibly stressful environment and could very well be seen as an attack on their parenting skills. I really have no experience with Autism and am just quoting the research in the documentary. And autism was only mentioned as a side so thanks for pointing out that there isn’t a lot of concrete evidence linking autism and diet. Eating your broccolini & white bean recipe for breakfast as I read this post! Yum, yum. I brought a “nutribullet” last year and its the best way of getting raw greens into my body. I have a green smoothie each morning. Growing your own veg is something I’m getting into more and more. And not just for the cost benefits… they taste so much better! Such a great post, thank you so much for sharing! How i include more vegies is when i make spaghetti bolognese, instead of pasta, i use grated zucchini. I put it in hot water for 5 minutes before placing the bolognese on.